CERTIFICATE \ OF \ Birth and Baptism. TO THESE TWO PARENTS: As John Pathemore and his Wife \ Elenen a born Gerberich \ was born a child on the 16th Day of \ Augustus in the year of our Lord 1835. \ This CHILD was born in Sivatara Township \ in Dauphin County, in the \ State of Pennsylvania in North America; \ was baptised by the Rev. Finkel \ and received the name George Washington. Witness present at the Act of Baptism: \ His Parents. ‘Twas the commission of our Lord, \ To teach the Nations and Baptise: \ The Nations have received the word, \ Since HE ascended to the skies. Repent and be baptized, he said, \ For the remission of your sins \ And thus our sense assists our faith \ And shows us what his gospel means. Our wasting lives grow shorter still \ As days and months increase; \ And every beating pulse we tell, \ Leaves but the number less. Infinite joy or endless woe \ Attends on every breath; \ And yet how unconcern’d we go \ Upon the brink of death! Hand-lettered, hand-colored, on printed form. The central text in Roman print with blanks infilled by hand is in a decorated rectangular frame in the center of the document. A basket with flowers and one of the verses are below it. Two verses are in frames in the upper corners. The main text is flanked by two large inward-facing angels with lyres, one holding a wreath and the other with a bird. A spread-winged eagle holding a banner in its beak is in the upper center. In each lower corner are two birds perched on a tree with leaves and fruits. Between them are two baskets with flowers as well as three bunches of flowers. 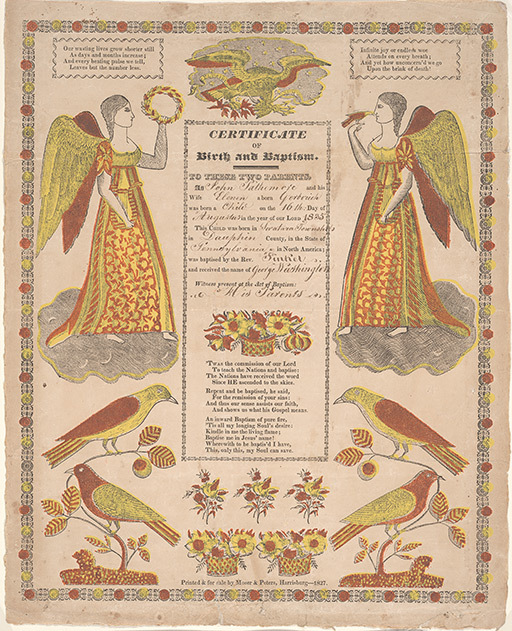 The entire page is enclosed by a decorative border. Associated Names: Peters, Gustav S.
Klaus Stopp, The Printed Birth and Baptismal Certificates of the German Americans (East Berlin, Pa.: Russell D. Earnest Associates, 1998) vol. 3, p. 46.